New investment has been made in CNC machinery. The purchase of the new Hurco CNC machining centre will increase our productivity and reduce lead times. 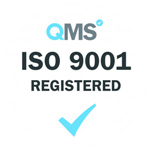 We have now received our ISO9001 certification. Paul Hair and Yvonne Pascoe received the ISO9001 certificate from Tom Graham from QMS. The certification is a boost to our commitment to develop and improve systems and customer interaction. We would like to thank all our friends, customers and suppliers all the best over the holiday period. Hope all have a happy and prosperous 2016. SOLIDWORKS 3D CAD software Ai Engineering have just installed new solidworks software. This CAD software package will quickly unlock the benefits of this powerful 3D design solution for rapid creation of parts, assemblies, and 2D drawings. Application-specific tools for sheet metal, weldments, surfacing, and mold tool and die make it easy to deliver best-in-class designs. Thank you to all our customers for their continued support. 2014 was a year when we invested in new machinery to enhance the services we can offer. Hopefully 2015 will see continued growth and investment. Thank you all and best wishes to everyone for the coming year! On the centenary of WW1, we remember the 888,246 British service men and women who gave their lives during this war to ensure a brighter future for us all. We will remember them! Following a special request from a motor enthusiast Ai Engineering have just machined carbon fiber hinges complete with aluminum inserts.